It was former faculty member Sharon Ramos-Goyette’s idea to structure an LC around the HOPe House, says Neuroscience Program Director John McCoy. Students in an LC take two linked courses and participate in a third activity that integrates the academic material. In this case, students study the “nuts and bolts” of the nervous system in the psychology course Brain and Behavior, approach neuroscience from a more clinical perspective in their Neurological Basis of Behavior course – a team-taught course involving Boston-area doctors with expertise in autism – and use that understanding while working one-on-one with HOPe House children. 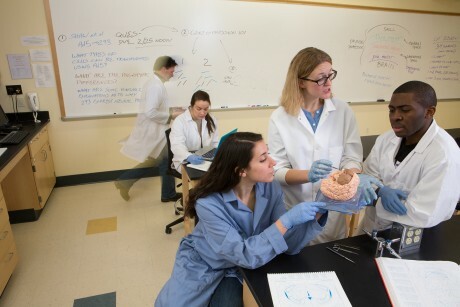 LC students have the unique opportunity to learn from MD’s who teach at the College, including Adam Cohen, Neurology Inpatient Medical Director at Massachusetts General Hospital, and David Dawson, a senior neurologist at Brigham and Women's Hospital. Dr. Dawson, who has taught the LC from the start, shapes his lectures to prepare students for their service experience. This pays off. The students examine “concepts from more of a clinical, problem-solving standpoint, as if we were medical health professionals that needed to use the knowledge we learned to make a diagnosis,” Tori says. The fact that they “get to go back and have group discussions about what they saw, what it means and how they should respond, interact...” says Ms. DeSisto, makes them particularly strong volunteers. “Most of us found a new passion in working with children with special needs. We saw that what we did made a difference, which was enough to put a smile on all of our faces.”. Through the back-and-forth with their teaching team, rounded out by Assistant Professor of Biology and Neuroscience Heather Yu and Post Doctoral Teaching Fellow Justin Dore, and through weekly journals that include objective assessments of clients’ progress as well as personal reflections, the students develop keen observation, critical-thinking, and problem-solving skills while examining their own values. They can discover whether a profession in medicine or in a clinical setting is right for them.